We had a 30 Day Challenge in January this year and it was such a hit! We received over 6,000 entries! Listeners were given a challenge to listen just to KCBI Radio to see how effective the encouraging music would be in their lives! We received so many stories from listeners about how they were able to focus on the goodness of Who God is instead of getting distracted with the circumstances around them! I even talked to a few 20 somethings that told me they gave their life to the Lord listening to a 30 day challenge! This was definitely motivation enough to keep having these in our promotional bag! 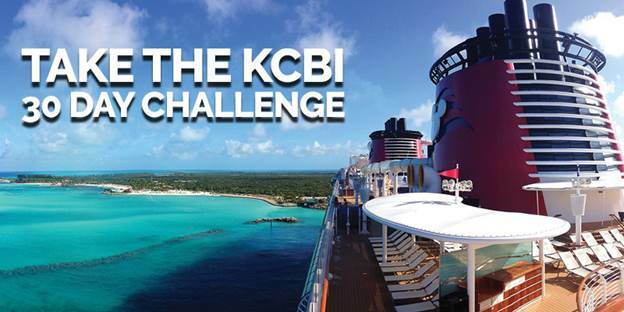 KCBI’s 30 Day Challenge: Qualify today for an all-inclusive Disney Cruise! How about referring a friend to come along side you? If you refer a friend, you both could have a chance to win a $100 grocery card and qualified for an All-Inclusive Disney Cruise for your family worth close to $5,000! From now until February 10th, listen each weekday morning at 7:12 am and 10:12 am and each afternoon at 12:12 pm & 4:12 pm! If you hear your name announced, you will have only one hour to call and instantly win a $100 Grocery Gift Card and then you are qualified for the Disney Cruise! Sign up for the KCBI 30-Day Challenge here!